Nurses serving in the uniformed forces are often first responders to medical crises throughout the world. The U.S. Public Health Service Commissioned Corps is an elite team of full-time, well-trained, highly qualified public health professionals who respond to public health crises at home and abroad. This article briefly describes responsibilities and roles of nurses during deployments; offers an exemplar of deployment to West Africa for Ebola response; and reviews the outcomes of the response effort. The author then offers reflections about her deployment experiences. Citation: Brown-Stephenson, M., (January 31, 2017) "United States Public Health Service Nurses: Deployment in Global Crisis" OJIN: The Online Journal of Issues in Nursing Vol. 22, No. 1, Manuscript 6. Nurses serving in the uniformed forces are often first responders to medical crises throughout the world. A recent outbreak in 2014 involved the Ebola virus. Nurses in the United States Public Health Service (USPHS) were deployed to Africa to respond to this outbreak. This article describes the history and mission of the Public Health Service and the responsibilities and roles of USPHS nurses during deployments in response to a global crisis. The author also provides a personal reflection about her deployment to Liberia, Africa during the 2014 Ebola virus outbreak, including a brief overview about Ebola and description of the outbreak event. More than 6,800 Commissioned Corps officers work on the front lines of public health. They fight disease, conduct research, and care for patients in the most underserved and vulnerable populations domestically and abroad. Corps officers serve in 15 careers in a wide range of specialties within 22 federal agencies. The USPHS Commissioned Corps is an elite team of full-time, well-trained, highly qualified public health professionals comprised of physicians, dentists, nurses, therapists, pharmacists, health services administrators, environmental health specialists, dietitians, engineers, veterinarians, and scientists. 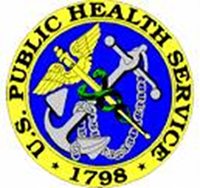 USPHS falls under the leadership of the Assistant Secretary of Health and the Surgeon General within the Department of Health and Human Services (HHS). The mission of the U.S. Public Health Service Commissioned Corps is to protect, promote, and advance the health and safety of our nation. As America's uniformed service of public health professionals, the Commissioned Corps achieves its mission through: rapid and effective response to public health needs; leadership and excellence in public health practices; and advancement of public health science. The core values of the Commissioned Corps are noted in Table 1. Provides vision and purpose in public health through inspiration, dedication, and loyalty. Demonstrates a commitment to public health through compassionate actions and stewardship of time, resources, and talents. Exemplifies uncompromising ethical conduct and maintains the highest standards of responsibility and accountability. Exhibits superior performance and continues improvement in knowledge and expertise. For more than 200 years, men and women have served on the front lines supporting our nation’s public health in what is today called the U.S. Public Health Service Commissioned Corps. The Commissioned Corps traces its beginnings back to the U.S. Marine Hospital Service, protecting against the spread of disease from sailors returning from foreign ports and maintaining the health of immigrants entering the country. Today, Commissioned Corps officers are involved in health care delivery to underserved and vulnerable populations; disease control and prevention; biomedical research; food and drug regulation; mental health and drug abuse services; and response efforts for natural and man-made disasters as an essential component of the largest public health program in the world. A challenge coin is a time honored tradition... 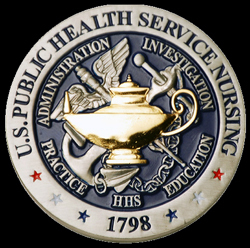 Figures 1 and 2 are challenge coins of the USPHS and the USPHS Nursing. A challenge coin is a time honored tradition (usually military) that builds camaraderie, enhances morale, and signifies service/duty to a particular campaign. It is carried by organization members and given in recognition of achievement. As America's uniformed service of public health professionals, one of the many ways the USPHS Commissioned Corps achieves its mission is through rapid and effective responses to public health needs. To address urgent needs following acute public health emergency, the Office of the Surgeon General created the Office of Force Readiness and Deployment to activate, mobilize, and deploy qualified officers expeditiously to a disaster site. A Commissioned Corps deployment is defined as a directed, temporary assignment of officers from their assigned duties within HHS and non-HHS organizations in response to a national public health emergency. Corps officers can also be deployed for a situation presenting a significant threat to the public health of a State, Tribe, or local community (Commissioned Corps, 2014). Nurses perform integral roles during critical times in the lives of their patients. Nurses hold patient hands, listen to anxieties and fears, and provide evidence based clinical interventions that offer their patients hope and healing. The section below discusses several important aspects of the response, including a brief overview of Ebola; facts about Liberia, the outbreak area; and a description of the joint collaboration and the response team. Ebola, formerly referred to as Ebola hemorrhagic fever, is an opportunistic virus that can cause morbidity and mortality in humans if untreated. Ebola, formerly referred to as Ebola hemorrhagic fever, is an opportunistic virus that can cause morbidity and mortality in humans if untreated (Centers for Disease Control and Prevention [CDC], 2016; World Health Organization [WHO], 2016). In 1976, the virus was first encountered near the Ebola River during two outbreaks, one in Nzara, South Sudan and the other in Yambuku, Democratic Republic of Congo. The last and most virulent outbreak occurred in March of 2014, in which the virus spread, wreaking havoc and fear through the countries of Guinea, Sierra Leone, and Liberia. On August 8, 2014 the World Health Director-General declared the West Africa outbreak to be of such proportion to warrant a status of Public Health Emergency of International Concern. Researchers believe that transmission of the virus occurs by direct contact (open skin or mucous membrane) with blood, secretions, other bodily fluids of infections persons, and with objects (needles/ syringes) or materials (clothing or bed) contaminated with these fluids (CDC, 2016; WHO, 2016). Healthcare providers contract the virus while treating patients when infection control precautions are not strictly practiced. It has been shown that even after death of the host; the virus is still transmittable from the deceased (CDC, 2016; WHO, 2016). Traditional burial ceremonies of mourners, cultural practices, and religious customs were respectfully reviewed in the effort to stop the 2014 epidemic spread. The total population of Liberia is approximately four million people. The capital city of Liberia, Monrovia, houses about one fourth of the entire population (one million people). There are few paved roads outside of the capital city and the entire land area is that of the state of Tennessee. The weather in Liberia has two distinct seasons, rainy and dry, both of which are hot and humid continuously. There are major issues with availability of clean water and appropriate sanitation. Liberia is reliant on non-governmental organizations and the international community for basic medical care. The medical infrastructure in Liberia has been largely destroyed partly due to two civil wars, and there are limited physicians (approximately 56) in the country. This is a ratio of one doctor for every 76,000 people. Liberia is reliant on non-governmental organizations and the international community for basic medical care. The average life expectancy for males and females is 56.5 and 59.9 years respectively (Liberia, n.d.; World Health Organization, 2016). The response required collaboration from the Government of Liberia (GoL) in partnership with the United States government. There were many cohesive parts to tackle this major endeavor, including the Department of Defense, United Nations Mission, Centers for Disease Control and Prevention (CDC), United States Agency International Development, Federal Emergency Management Agency, and Office of U. S. Foreign Disaster Assistance, to name a few. The United States government facilitated the construction of 15 Ebola Treatment Units. 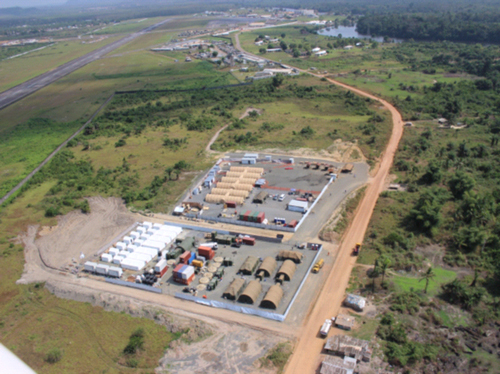 The United States government facilitated the construction of 15 Ebola Treatment Units (ETU). One was staffed by USPHS with the sole purpose of treating infected healthcare workers. This 25-bed field hospital was located in Margibi, Liberia roughly forty miles outside the capital city of Monrovia. It was an Air Force field hospital, built by Navy Sea Bees, supported by the Army, and staffed by USPHS Commissioned Corps – true collaboration at its finest. The Monrovia Medical Unit was specifically designed to treat infected healthcare workers. The Monrovia Medical Unit (MMU) was specifically designed to treat infected healthcare workers. Primarily this unit treated doctors and nurses at higher risk of infection because they were in close, sustained contact with Ebola patients who were symptomatic and infectious. 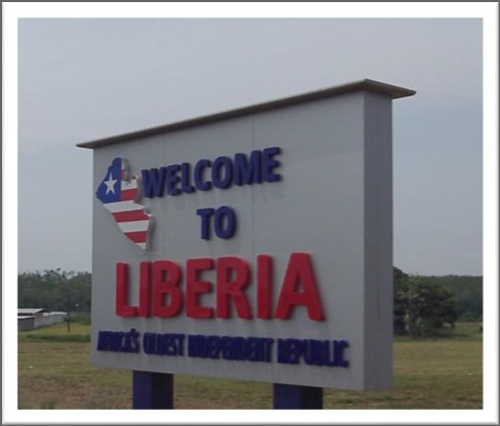 Photographs 1 and 2 depict a sign upon entrance to the country of Liberia, and an aerial view of the MMU compound. On the far side of Photograph 2 is the actual MMU treatment facility and the near side shows the living quarters of USPHS staff. Before the MMU construction, healthcare workers were leaving rapidly, and the volunteer pool was hastily declining. The MMU stood as a beacon of hope that advanced care was now readily available should a healthcare worker become ill (U.S. Department of Health and Human Services, 2014). The MMU stood as a beacon of hope that advanced care was now readily available should a healthcare worker become ill. Recognizing that the only way to control and contain the threat of Ebola in America and the world was to defeat the disease at its source, the U.S. rendered aid to fight the virus in West Africa. In that large scale effort to interrupt the transmission of Ebola, a total of four waves of USPHS officers were constructed and deployed between October 2014 and May 2015. Each team was extensively trained by the CDC at the Federal Emergency Management Agency (FEMA) Center for Domestic Preparedness in Anniston, Alabama. Each team member volunteered. The mission was to provide hope through care to Liberian and international healthcare workers and responders who may have the Ebola virus disease and continue efforts with the Liberian and international partners to build capacity for additional care. The team was segmented into four waves/phases with approximately 65 to 70 members per unit with the same unified mission. There were four different phases to the overall mission and each phase did have a slightly different focal point based strictly on the sequence of the response effort. Table 2 notes the unique mission for each of the four teams, including the primary goal. Figure 3 demonstrates the coin/knife designed to commemorate the shared victory of each team in the fight against Ebola, a military tradition (U.S. Department of Health and Human Services, 2014). Ensuring the wishes of the patient and family were completed and staying within safety and security standards required building of rapport and mutual respect. In every health crisis, barriers arise. So, too, with this endeavor. Common challenges when providing care in other countries often revolve around language barriers; cultural differences; religious beliefs and practices; and educational and public health understanding (Galanti, 2014; Holland & Hogg 2010). Our experiences reflected these challenges. Ensuring the wishes of the patient and family were completed and staying within safety and security standards required building of rapport and mutual respect. This section describes several examples of how we addressed the challenges at hand. Table 3 provides examples of actions taken at both individual and community levels by the deployment teams to meet the previously listed four key goals of the response strategy. Sensitivity to customs and cultural practices and demonstrating alternatives ways to cherish and honor long-standing traditions allowed for collaboration while maintaining respect for the Liberian people. As healthcare experts, we have extensive training in cultural competence and linguistic awareness. Sensitivity to customs and cultural practices and demonstrating alternatives ways to cherish and honor long-standing traditions allowed for collaboration while maintaining respect for the Liberian people. Our very best efforts and the latest technology did not yield a positive outcome for a few patients we encountered. However, in general, allowing visiting family to see and/or communicate with their ailing loved ones strengthened our bond. For example, when the patient was unable to physically attend a visit, assuring that a note or encouraging word was passed along made a definite difference. Nurses were able to assist with final arrangements in a safe and humane fashion that still gave closure to families. Liberians have a deep connection with their ancestors and believe that the way they bid farewell to a loved one can have an influence on their own future life. There were concessions and compromises related to proper funeral/burial traditions. Inquiring about family preferences during preparation for burial was a solemn and humbling experience. We followed a specific process of washing the deceased loved one and paying final respects by touching and laying flowers on the body. Nurses also ensured that a favored item was placed with the deceased at time of burial. We worked with family members to help assure that the loved one(s) left behind had not offended the deceased in any way. A digital photo was taken and sent electronically to the family before the deceased were laid to their final resting places. Nurses were able to assist with final arrangements in a safe and humane fashion that still gave closure to families. The religious idea that those who became ill were possibly being punished and needed to ask forgiveness was one belief that was not fully overcome, but more or less worked around. We addressed this as best we could by providing education concerning the disease and its progression. We provided education to patients and families at several points, including during the stay at the MMU (to family that came to visit), and education after patient discharge. Giving honor to their religious beliefs while offering this education was important to achieving some success in this area. ...providers had to understand the educational system and its hierarchy in Liberia, and then build upon it to facilitate perceived new public health standards. In the U.S. we adhere to strict CDC/Occupational Safety and Health Administration (OSHA) guidelines/regulations to ensure the safety of the healthcare workforce. However, in Liberia, new and innovative ways were required to practice safely. First, providers had to understand the educational system and its hierarchy in Liberia, and then build upon it to facilitate perceived new public health standards. The ability to facilitate the step by step understanding of local citizens about how and why universal precautions are the bare minimum standard was a very rewarding endeavor. Additional challenges included wearing multiple layers of personal protective equipment (PPE), the amounts and strengths of chlorine needed, and providing fluid replacement in adequate amounts. Imagine completing a patient admission assessment wearing extensive PPE. Think about how the patient must feel to see the nurse dressed in such an outfit coming in to provide care. After patient care, the removal of PPE was a long and methodical process due to the mandatory safety and security of being sprayed with chlorine solution continuously during each step of the removal process. To teach this process, we allowed local nurses to first view the entire donning and doffing process utilized in the MMU, and then return demonstrate the entire process while answering any questions. Examples of maintaining patient safety while caring for persons with Ebola virus disease included teaching local nurses about fluid loss and replacement; equipment use, and advanced cardiac life support techniques. We explained the amounts of fluid loss sustained by patients during various phases of the disease and showed ways to potentially compensate for that loss (e.g., simulating various ways to replenish fluid loss and some of the techniques we used). We explained the benefits of new equipment and taught the nurses how to use it properly. Learning to listen and fully comprehend what is being expressed took a little extra concentration due to accents and word choices. Professional nurses are educated about active listening techniques and the importance of demonstrating empathy with patients. Deployed corps members become more aware of subtle nuances that could either open or close pathways to effective communication and translated that success into better healthcare outcomes. For example, there were difficulties with language and accent. Learning to listen and fully comprehend what is being expressed took a little extra concentration due to accents and word choices. Cultivating an environment of mutual respect and common ground fostered teamwork between local healthcare workers and Ebola treatment unit healthcare staff. This opened dialogue and created a foundation to encourage communication and collaborative efforts. Ultimately, open dialogue blossomed into a win-win situation. We were afforded the opportunity to visit a local hospital and Ebola treatment unit and we in turn were given the unique privilege and honor to show our unit to others. We were then able to discuss some obvious differences in techniques and forms of delivery. I feel truly blessed for the opportunity to serve and a fight Ebola disease in a world crisis. The trip was a bundle of pure emotion and a life changing experience. From the notification that I would be one of the USPHS officers to assist in the effort to the reintegration back home, I learned so much about myself and others around me. Excitement, fear, anxiety, calm resolve, victory, disappointment, the list could go on… these were just some of the emotions I felt during the deployment. Below I will briefly reflect on several aspects of my deployment. The people. I was a part of Team 4 (see Table 2). We were the last team to staff the MMU. Our mission was the same as the previous teams: to care for infected healthcare workers. We were given the special honor of meeting local healthcare workers. The encounters and interactions are forever etched in my mind. The genuine love and care that these professionals had for us was truly amazing. Their attitudes and willingness to share were just so refreshing. They were really overwhelmed, but they had a calm resolve to just keep pushing forward during the crisis. They frequently expressed their thankfulness for our willingness and ability to give of our lives and time to come and assist in the effort to eradicate this virus. Living conditions and the physical environment were definitely a change... we resided in tents and used outside facilities. The environment. Living conditions and the physical environment were definitely a change from what most of us were accustomed, as we resided in tents and used outside facilities. The tent housed two rows of five, double stacked, military issue cots with approximately three feet of walking space on each side. The facilities were in a separate container with chlorinated water; as they were military issue, the amount of space was very limited. The weather was yet another hurdle. The average temperatures during our stay in Liberia were mid 90s on a cool day and mid 100s on a normal day. The humidity was always high. Adding to the challenge of the heat and humidity was the donning and doffing PPE to care for patients. Average donning time was approximately 40 minutes; doffing time was a minimum of 40 minutes, if you were not exposed to any direct contact with bodily fluids. More time was necessary for specific area washing with chlorine solution if you add emptied a bedpan or started intravenous fluids. The weather was yet another hurdle. The physical environment was an open field area. Local insects and rodents (e.g., spiders, snakes, mosquitoes and various color lizards) were different in size and shape. The greatest challenges related to insects and small animals was the lack of facilities inside the tent; we had to leave our tent to visit the facilities when the urge would arise, no matter the time of day or night. My leadership skills and techniques, communication styles, and even body language were tested. I gained new sustaining motivation to press toward a greater understanding of the ultimate goal and to determine the best route to get there with the least amount of adverse outcomes. My leadership skills and techniques, communication styles, and even body language were tested. I found out just how far I am willing to give, push, and fight to be a part of the team and ensure that we build and sustain a cohesive unit. The trip was very rewarding in that I was able to experience, firsthand, a third world country in medical turmoil. This is nursing education and professional development beyond what one can read in a textbook. Upon reflection about my deployment experiences, I identified some lessons learned. I offer these with food for thought for those who may be considering service in the USPHS or some other arena to serve globally in response to emerging health concerns. It is helpful to keep an open mind. Shape Your Perspective. It is helpful to keep an open mind. In my opinion, perceptions affected by my deployment experiences included such examples as my ability to: truly see the glass as half full as opposed to half empty; let go of entitlement (what is owed you); and believe that life is a blessing. Luxury and privilege are defined differently in every context and the true meaning of need versus want may find itself at the forefront of your thinking. Seek to gain new insight and fresh perspective about your worldview. Even challenges and/or obstacles may be opportunities to expand your horizons. Seek to gain new insight and fresh perspective about your worldview. Have High Expectations. Accept the deployment duty assignment with high expectations. You are leaving family and friends but for a greater good. You plan to be of service and assistance to those in need. Know that you will gain so much more from the opportunity afforded you. Plan for the worst and hope for the very best. Know you will utilize all the education and experience you have acquired. Expect to think outside the box because you will not have all the tools and resources at your disposal to which you are accustomed. Communicate. Communication is key. Discuss challenges openly and see what avenues open to resolve the issues at hand. Draw on team level knowledge and expertise. Reflect. Review your own personal morals/values and reasons for doing your professional service well. A journey to serve in a Third World country, or work with vulnerable populations anywhere, can inspire thankfulness for the privilege to live in a developed area of the world and the duty to help less fortunate persons. I found myself asking, do I look at “good will toward others” as just a concept for Christmas time, or is that my life philosophy? I am truly grateful for the journey throughout my deployment. The question most often asked of me is, “Would you go back now that you know the challenges you would face?” and my answer is always a resounding YES!!! The U.S. Public Health Service (USPHS) Commissioned Corps includes nurses and other healthcare providers who are highly trained and are often first responders to emerging healthcare concerns and crises throughout the world. We work on a daily basis to eradicate disease and care for the most vulnerable persons. Our missions are both at home and abroad. This article has briefly described the Commissioned Core of the U.S. Public Health Service, and included descriptions about the experiences of one military nurses deployed in response to a recent outbreak of Ebola virus in Liberia, Africa. It is but one example of nurses all over the world responding to health crises, as they have done throughout history of the nursing profession. CAPT Michelle Brown-Stephenson is a Regional Nurse Consultant in the Federal Bureau of Prisons South Central Region and a Commissioned Corps Officer in the United States Public Health Service (USPHS). CAPT Brown-Stephenson has served 20 years in correctional nursing in various sub specialties. She has deployed in staff and leadership positions in response to numerous public health catastrophes. Michelle earned a baccalaureate in nursing science degree, dual Master’s degrees in health education and medical librarianship, and advanced certification as a Health Education Specialist. She is currently pursuing a PhD degree in public health. Galanti, G. A. (2014). Caring for patients from different cultures. Philadelphia, PA: University of Pennsylvania Press.